When you select entities in a drawing, the selection method and the display of selected entities, e.g. whether grips display or not, is controlled by a number of settings. Selection settings sit in the Selection settings group of the Program Options settings category in the Settings dialog. Determines wether or not entities highlight on screen when selected. Determines whether the entire raster image highlights or only the raster image frame when selected. Controls whether subsequent selections replace the current selection set or add to it. ON : The selection set is extended if you select additional entities. Press and hold the Shift key to remove entities from the selection set. OFF : You cannot add entities to a selection set. The newly selected entity or entities replace the existing selection set. However, if you press and hold the Shift key, you can add entities. If you select an entity that was already selected while pressing the Shift key, this entity is removed from the selection set. Controls automatic window selection (inside or crossing) when selecting entities. The value is stored as a bitcode using the sum of the selected options. negative: Disables window selection, saving current value. 1 = draws a selection window if the mouse is over a blank area of the drawing when clicked. 2 = draws a selection window if the mouse is over an entity when dragged. Defines the size of the small square at the end of the selection cursor ( ) . If you select an entity by clicking the Pick Box must touch or overlap the entity. The default size of the Pick Box is 3. ON : Allows to define a selection window by dragging:press and hold the left mouse button to define the first corner of the rectangle, then move the mouse to define the size of the selection window and release the mouse button to define the opposite corner. OFF : Define the selection window by clicking two opposite corners. Controls whether you select objects before or after you issue a modification command. ON : Allows to first compose a selection set, then launch a modification command. OFF : You must first start the command, then compose the select entities. Controls the selection of groups and associative hatches. 0 = No group selection, nor associative hatch selection. 1 = Group selection: if a member of a selectable group is selected, all members of the group are selected. 2 = Associative hatch selection: the hatch and its boundary are selected, no matter what is picked: the hatch or the boundary (not supported yet). 3 = Group selection and Associative hatch selection. Controls which properties must match for an entity of the same type to be selected with the SELECTSIMILAR command. Controls the display of selection area effects. Controls the transparency of the selection area: the higher the value the more opaque the selection area. Specifies the color for crossing selection areas. Specifies the color for window selection areas. 3 = both, when no commands are active and when a command prompts for entity selection. When the QUAD cursor menu is active, SELECTIONPREVIEW is neglected, unless a command prompts for entity selection. Controls the appearance of highlighted entities: 0=dashed lines; 1=thickened lines; 2=dashed and thickened lines (not yet supported). Controls which entity types are excluded from selection previewing. Specifies the highlight method: 0=dashed lines; 1=use different color; 2=use thickened line; 3=use different color and thickened line. Specifies the highlight color to be used when HIGHLIGHTEFFECT is 1 or 3. 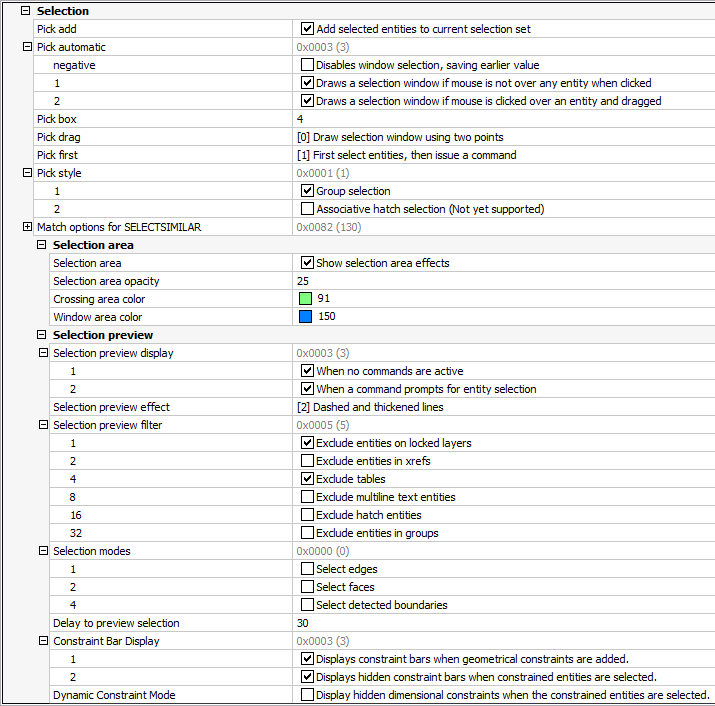 Defines which subentities should highlight in selection preview. The variable is stored as a bitcode using the sum of the values of all selected options. Click the buttons on the Selection Modes toolbar to set the value of SELECTIONMODES. A pressed button indicates the option is selected. 4 = Enable boundary detection ( ). Controls whether closed boundaries in XY-plane of the current coordinate system or on the face of 3D solids highlight when no commands are active. The BOUNDARYCOLOR system variable specifies the color for highlighting detected boundaries. * Hold down the Ctrl-key to invert the status of the Select Faces option: if ON allows to select 3D solids, if OFF allows to select solid faces. Repeatedly pressing the TAB key, while keeping the cursor at the same position, highlights all included subentity types one by one. Controls the visibility of a geometric constraint at its creation or selection. Controls the visibility of hidden dimensional constraints when the constrained entity is selected. When the cursor is over an entity with a dimensional constraint, the blue constraint glyph displays. Specifies how many milliseconds to wait before highlighting the (sub)entities under the cursor. If the Grips system variable is different from zero, grips display on selected entities. Grips settings sit under Display/Viewing in the Drafting settings group of the Drawing settings category in the Settings dialog. 1 : Display grips. Polyline endpoint and midpoint grips. 2 : Display grips. No midpoint grips on polyline segments. Toggles the display of grips on entities in blocks on/off. Sets the color of unselected grips. Default value is green (index color no. 72). Sets the color of selected grips, so called 'hot grips'. Default value is red (index color no. 240). Sets the color of an unselected grip when the cursor pauses over it. Default value is blue (index color no. 150). Sets the size of the grip box, expressed in pixels. Default value = 4. Suppresses the display of grips if the number of selected objects exceeds the value of GRIPOBJLIMIT. If set to 0 (zero) grips always display. (Not supported yet) Determines whether grip tips display when the cursor hovers hover grips on custom entities or dynamic blocks that support grip tips. Toggles the magnetism of grips on/off. Sets the grips attraction distance: if the cursor is within this distance the cursor is attracted by the grip and jumps to it.